Ramon Bautista is not allowed to visit Davao City due to 'HIPON' remarks for Davao City''s women on his jokes during the Kadayawan Festival last Saturday, August 16. According to Maayong Buntag Mindanao Official Facebook page Bautista is now "Persona non Grata" in Davao. 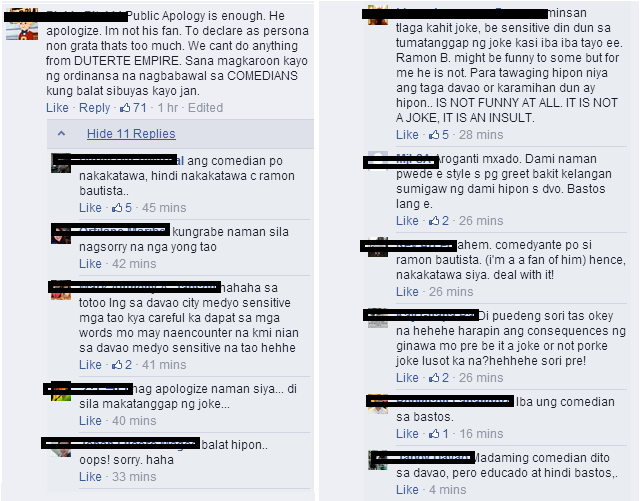 Even though the Comedian Ramon Bautista already apologized for his jokes on his tweeter he was still banned in Davao. Hipon (Shrimp) is a Filipino pejorative referring to women with beautiful bodies, but unattractive faces, wherein as you only eat the body of the shrimp you exclude the head. Monday, August 18 when Bautista posted another apology on his Twitter account as embedded below. Persona non Grata is defined as an unacceptable or unwelcome person. Post by Maayong Buntag Mindanao ( Official ). Public Apology is enough. He apologize. Im not his fan. To declare as persona non grata thats too much. We cant do anything from DUTERTE EMPIRE. Sana magkaroon kayo ng ordinansa na nagbabawal sa COMEDIANS kung balat sibuyas kayo jan.
Watch the actual video of the said event as reported by GMA News below.